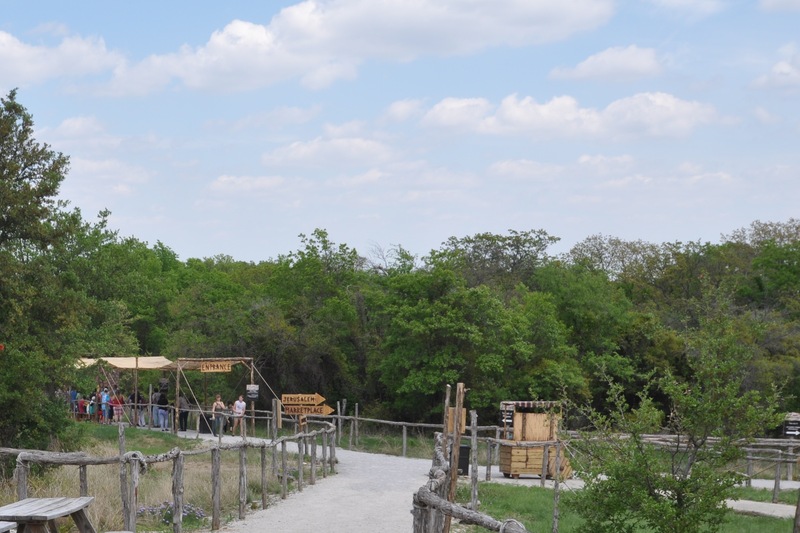 Wow — I thought we were busy on the first weekend, but the second weekend was much, much busier. I don’t think we stopped all day on Saturday! As soon as we finished one tour group, it was time to get ready for the next one. So many people — but the cast just kept on doing their jobs, and it all went smoothly. The Path of Plagues (where I was) tells the story of the Israelites in slavery in Egypt, and how Moses convinced Pharoah to let the people go. 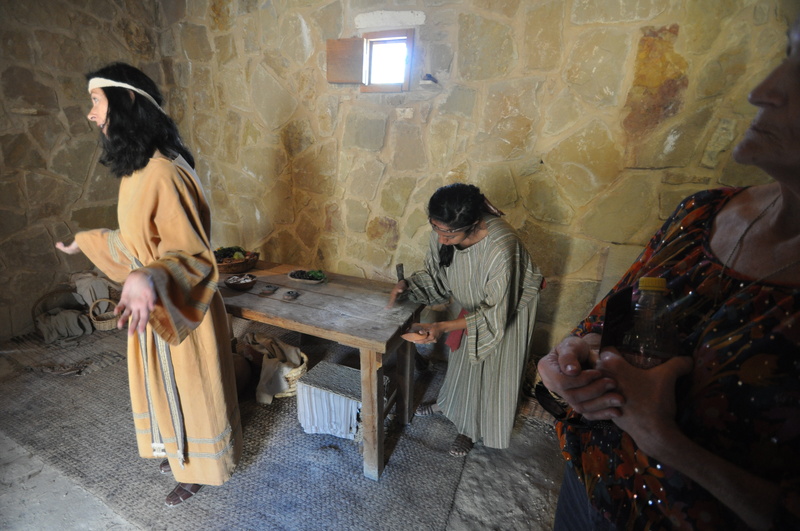 The Village tells the story of the Passover Seder, and why it is important to people even today. 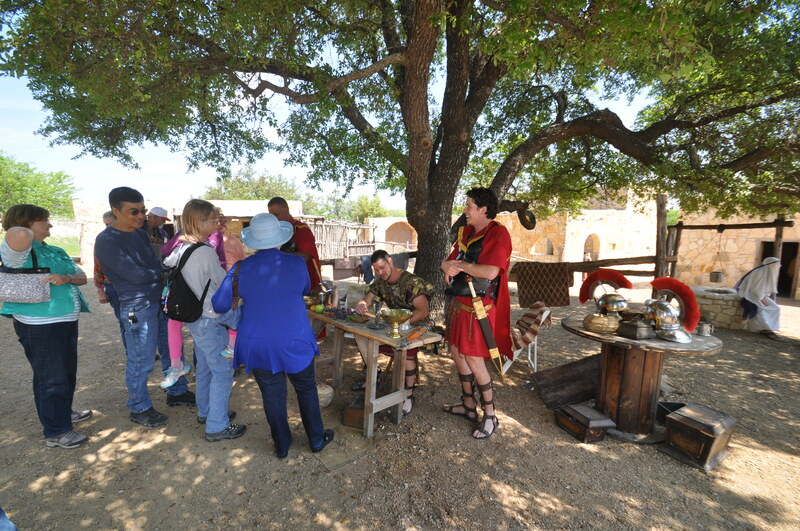 This is the section where most of the actors work — there are Roman soldiers, a Tax Collector, the High Priests, several families demonstrating and sharing parts of the seder meal with visitors, and all of the villagers who interact with the guests, Jesus, and the Romans. 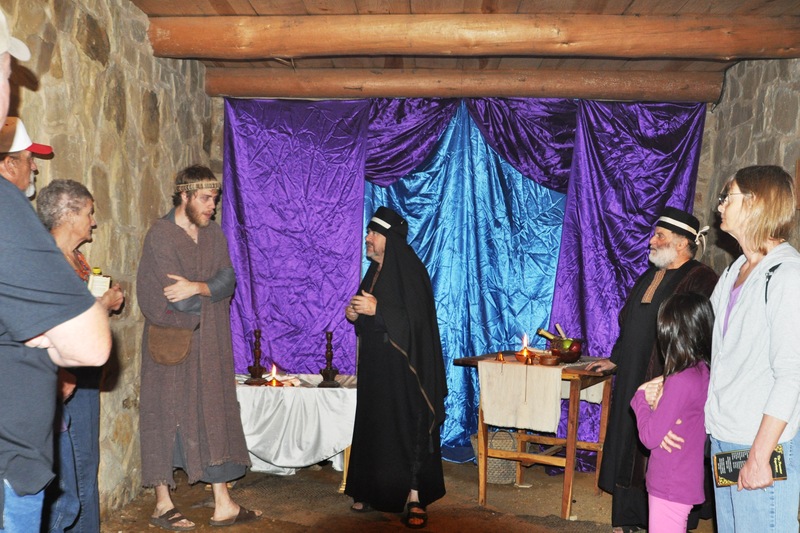 The Upper Room shows Jesus and his disciples at the Last Supper. It was a great experience, but I admit I was exhausted when I got home on Saturday night. I’m glad I had Sunday to recuperate before going to school today! 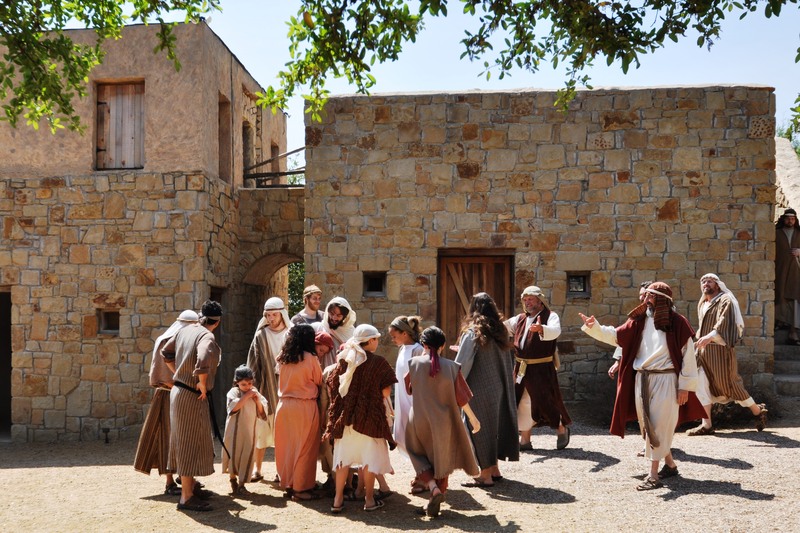 Visitors watch children in the Afrikommen scene searching for a hidden package of unleavened bread. The actor hiding the packet kept moving it, so the kids never did know where to find it, since every time was different. 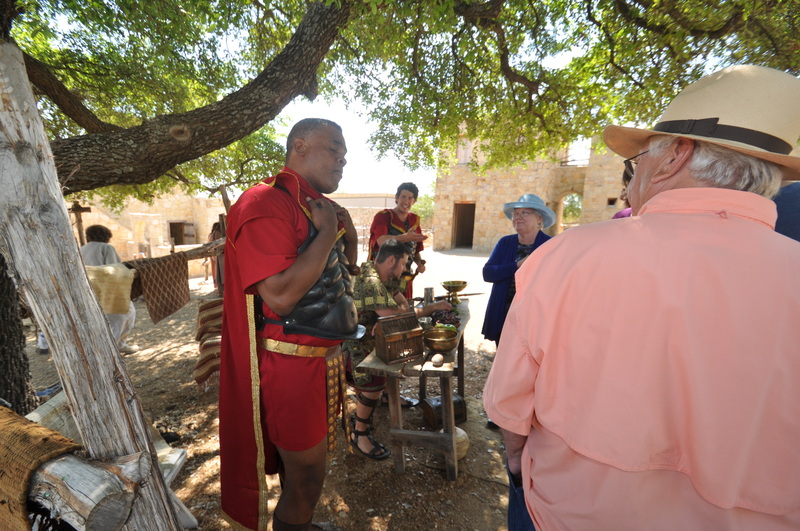 Actors in the House of Leven explained why all of the leven (yeast, and yeast-raised bread) is removed from the home for Passover, and shared stories of the preacher from Galilee who was making the High Priests angry. The villagers in the center of the village had a lot of improvisation to do — I think that’s a hard job, to be out there, visible all day long, and have to constantly stay in character. 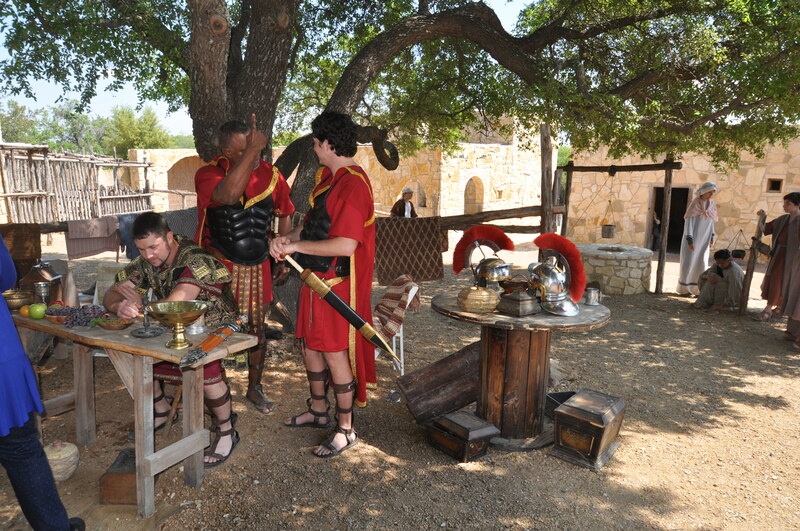 The Roman soldiers and the tax collector collected from everybody — including the time travelers — and provided both scary and funny moments. They were great! 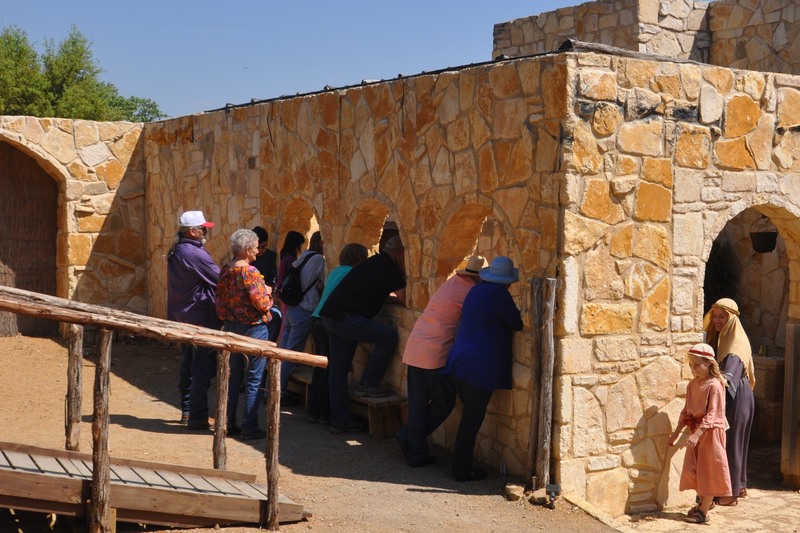 This is the start of the Passover Experience — we had lines of guests waiting to get in. Each “tour group” of “time travelers” was 15-25 people. The Egyptian family affected by the plagues had cool costumes, but a lot of awful things happened to them — including the death of their first-born son. The special effects for The Path of Plague were pretty impressive — we had hail, locusts, rain, lightning, and “darkness so intense you can feel it”. The special effects wizards on the roof must have gone through a ton of ice (literally) for all the hailstorms they created over the 5 days we performed. Maverick and Riley moving into position for their roles in The Path of Plagues. 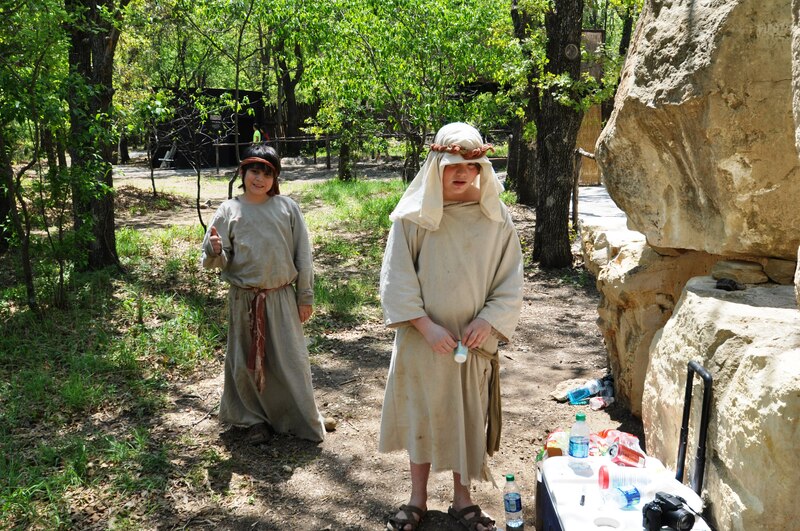 Maverick was Abraham last year, too, and Riley is the “scary man” who frightens Abraham. He’s covered in boils from one of the plagues. Usually when I am performing, there is a backstage area or green room where actors relax between their scenes. 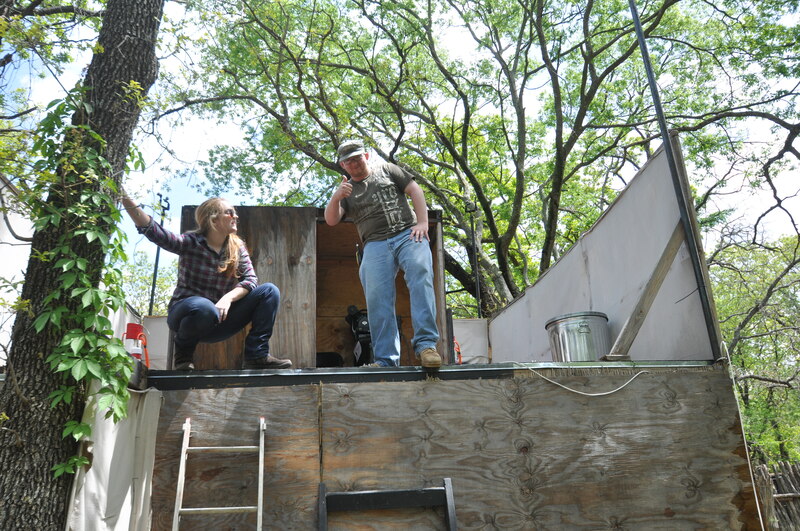 For this production, our backstage area was a cooler hidden behind a rock wall. They brought us lunch there, and we kept sunscreen and water there — but there wasn’t much time to relax between performances, because we were so busy. 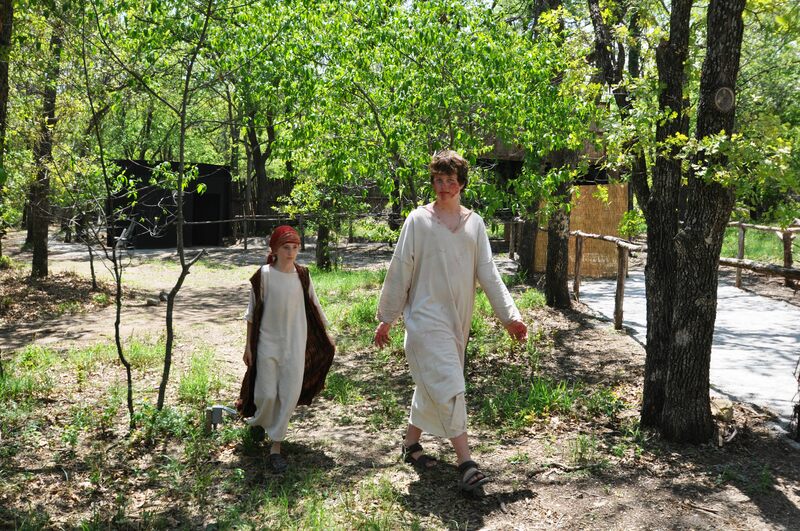 No wonder they had three kids playing Abraham, and three sets of tour guides! I’m the Abraham on the right in this photo, and Binyon is the Abraham on the left. 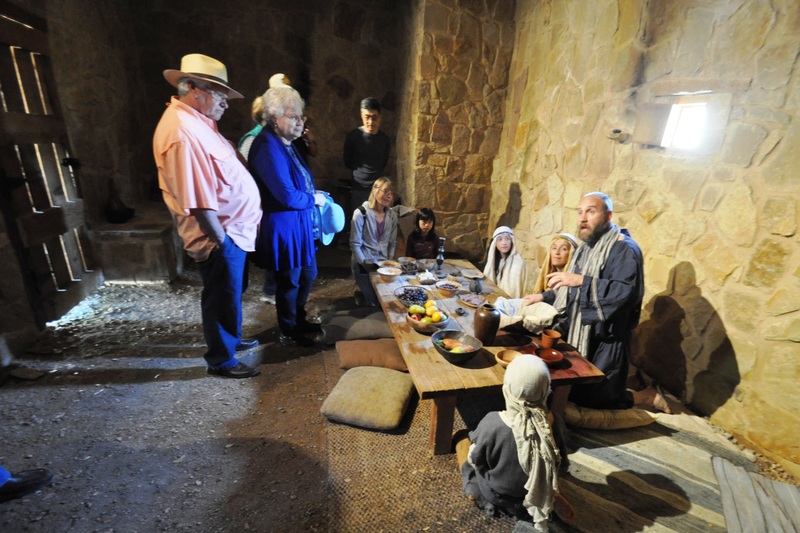 Some “time travelers” (guests) get a lesson in the seder meal from a family in the village. They used the same words that real Jewish families use today to explain what makes the night of the Passover Seder different from other nights. 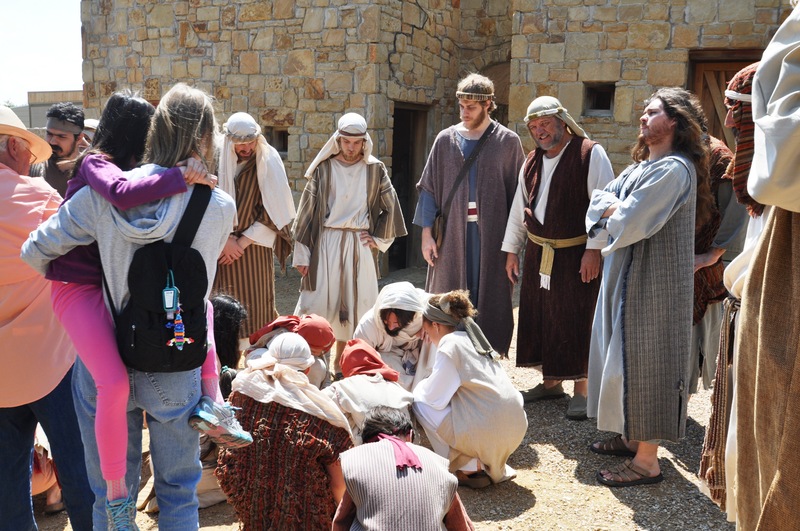 Judas is standing directly behind Jesus in this scene from the Village, as Jesus plays with some children — Judas has already taken his 30 pieces of silver from the High Priest at this point. 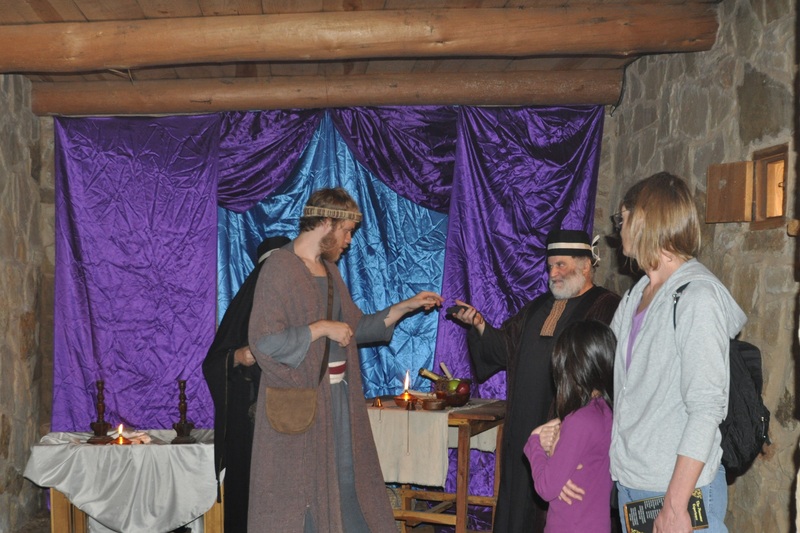 Jesus talking to the children in the village. 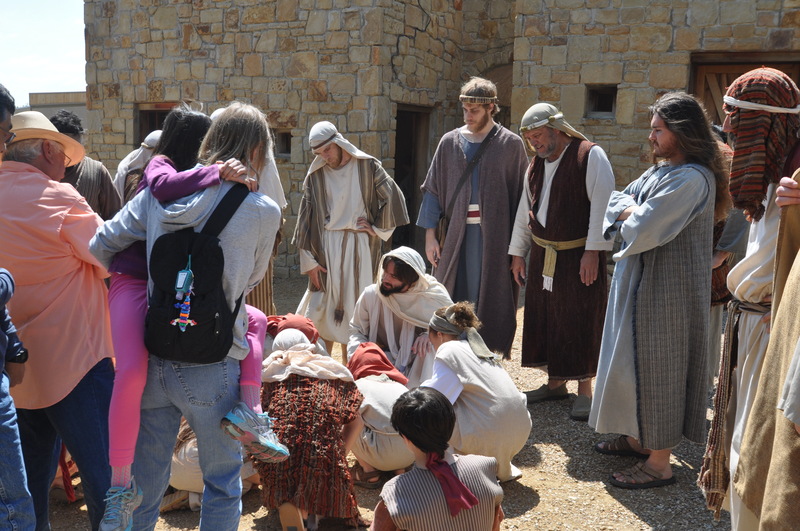 In the village section of the experience, there are several times when Jesus and the disciples interact with the villagers — this shows Jesus playing a game in the dirt with the children. 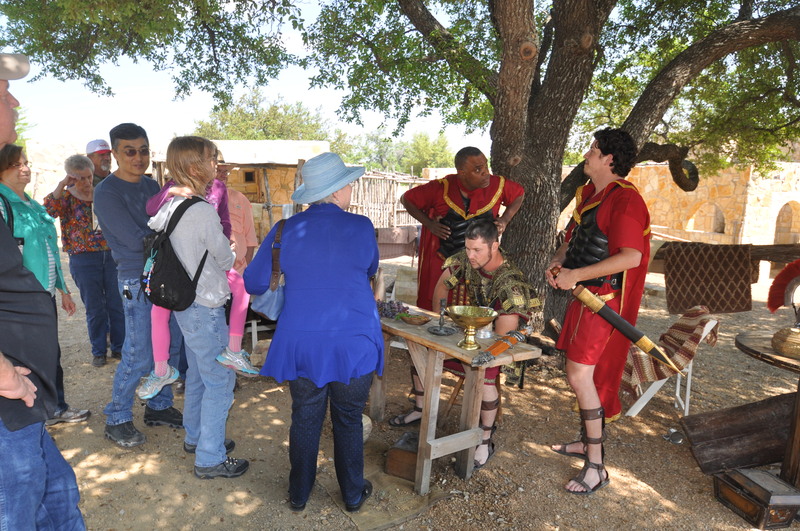 30 pieces of silver changes hands: Judas and the High Priest, with some “time travelers” (guests) at The Passover Experience.